ABOUT RACHEL AARON: Rachel lives in Athens, Georgia with her family. She has graduated from University of Georgia with a B.A. in English Literature. She has been an avid reader since her childhood and now has an ever-growing collection to show for it. She loves gaming, Manga comics & reality TV police shows. She also posts regularly on her blog about publishing, books and several other intriguing things. ABOUT TRAVIS BACH: Travis is a nerd who loves gaming, reading, writing & hiking. He’s Rachel Aaron’s husband as well as one of her strongest pillars. He shares Rachel’s fascination with gaming as reading fantasy. He lives in Athens, GA with his wonderful family. In the real world, twenty-one-year-old library sciences student Tina Anderson is invisible and under-appreciated, but in the VR-game Forever Fantasy Online she's Roxxy—the respected leader and main tank of a top-tier raiding guild. Her brother, James Anderson, is a college drop-out struggling under debt, but in FFO he's famous—an explorer known all over the world for doing every quest and collecting the rarest items. Both Tina and James need the game more than they'd like to admit, but their favorite escape turns into a trap when FFO becomes real. Suddenly, wounds aren’t virtual, the stupid monsters have turned cunning, NPCs start acting like actual people, and death might be forever. In the real world, everyone said being good at video games was a waste of time. Now, separated across a much larger and more deadly world, their skill at FFO is the only thing keeping them alive. It’s going to take every bit of their expertise (and hoarded loot) to find each other and get back home, but as the harshness of their new reality sets in, Tina and James soon realize that being the best in the game might no longer be good enough. FORMAT/INFO: Forever Fantasy Online is 498 pages long divided over nineteen numbered & titled chapters with a glossary of terms and a content warning note. Narration is in the third person via Tina Anderson aka Roxxy, and James Anderson aka Heal-A-Hoop. This is the first volume of the Forever Fantasy Online trilogy. June 1, 2018 marked the e-book publication of Forever Fantasy Online and it was self-published by the authors. Cover art is provided by Tia Rambaran and cover design is by Rachel Aaron. 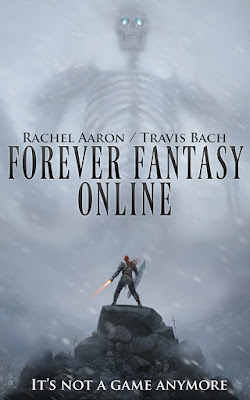 OVERVIEW/ANALYSIS: Forever Fantasy Online has a lot of firsts for Rachel Aaron, it's her first collaborative effort (with her husband Travis Bach no less), and it's her first foray into the LitRPG genre. Coincidentally it's Travis Bach's debut as well. I was lucky to be given an earlier draft of this book as well as the finalized version. The story is set from the viewpoints of a brother-sister duo, Tina and James Anderson. Tina and James are both massively experienced players in Forever Fantasy Online, a game that has taken the world by storm and managed to give an experience that's unparalleled in virtual reality. Tina's avatar is Roxxy, a stonekin warrior who performs the role of Tank in her guild. James on the other hand is a Jujubatu named Heal-A-Hoop (a cheetah like anthromorphic creature), both of them are great in the “Forever Fantasy Online” game unlike their real lives wherein their relationship is frayed horribly and their lives aren’t of much importance. They both log in at similar times along with many, many others and find out that there's been a snag, suddenly all of their virtual equipment and weapons no longer work as before. They seem to be locked into the game and not only that, the sensations are more life like and none of them can log out. They are stuck in the game and all of their previous conquests are coming back to attack them. Also all the other characters which are present in the game or NPCs (Non Player Character) have a violent hatred towards any and all players. These NPCs are also actively wanting to kill any player that they can get their hands on. This story is a classic LitRPG story wherein we get a spectacular view into the world of FFO and also the plot twists that are occurring simultaneously within both James' and Tina's POVs. The story builds up slowly as the reader shares the same confusion that these characters experience. We also get an idea much quicker than the characters but the world is more unknown to us than the characters. The story is literally into two quests, Tina is trying to save her guild members or what's left of it from impending doom rampaging behind them. James on the other hand is trying to save his own skin as the Jujubatus are hunting the players. Both of them have to undergo their own struggles and this is where we get to see how they respond to their individual challenges. I must admit amidst both the POVs I preferred James' struggles as his self loathing and easy going nature made his struggles that much more refreshing and relatable. Tina on the other hand while having more of the action, was a bit harder to understand. Tina is shown to be a stonekin and perhaps the authors' were more successful than they thought as her POV shows her to be hard and demanding. This behavior however is absolutely needed as you will learn when you read the story through her POV. Many of her guild mates dislike her but you can see how she's trying everything that she can to ensure everyone’s survival. There are a couple of other characters namely SilentBlayde and NekoBaby who are present in Tina's chapters and are quite fun to read about. SilentBlayde is Tina's second-in-command and does their best to make sure that Tina gets all the support she needs. NekoBaby is simply hilarious with whatever scenes she gets and I hope the authors explore her story in the sequels. The action sequences are pretty epic and feature terrific battle sequences. The action is very heavy in Tina's sections as they literally are marching to save their lives while battling ghosts, zombie skeletons, and many more creatures. All of these sequences mirror various vide games and are fun to read about. James' sections feature more of the world and the magical fights as his quest has him helping an NPC titled Ar'Bati to save his sister. Both these parallel tracks keep the readers engrossed however readers will easily have their favorites. Lastly I enjoyed how seamless this book was, the story was one fine mix wherein you couldn't tell which author wrote what section. I love this aspect in collaborated stories and FFO is a fine entry point. Overall the story expands really in depth and then ends on a solid cliffhanger, which make me want to read the next book The Last Bastion immediately. Forever Fantasy Online is definitely a book for the gamers among us readers, I'm not a gamer so there were some terms that were unknown to me. Thankfully the authors included a glossary which was great for a non-gamer like me. The one thing about the book which wasn't helpful was the book's pace which took a while to get going. Also the reveal as to the major reasoning about the world's status is never addressed and this is a major concern. I'm going to read the next one but I would have liked to know more about the whys and hows of the world. CONCLUSION: Forever Fantasy Online was one of my first LitRPG reads and it was an exciting one. I was intrigued about how Travis and Rachel Aaron's collaboration would be and it was a solid effort which I thoroughly enjoyed. 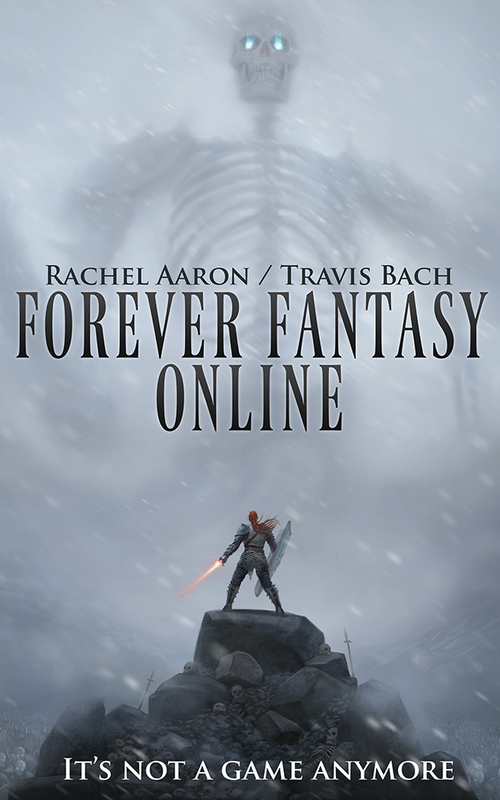 Forever Fantasy Online is a collaborative effort that showcases Rachel Aaron’s amazing skills and heralds a wonderful future for Travis Bach.